The SponGIS site and database has been designed to hold data pertaining or related to deep-sea sponges from around the world. The database is based on established Biodiversity Data Standards and has been purposely built to mirror the OBIS Schema, with some SponGIS specific extensions. This allows simple contribution of our data to a much larger and well used dataset, fulfilling our data archiving obligations for the SponGES project. 1. Download the SponGIS data submission template. 2. Fill in the template as best you can. The procedure for submitting data to SponGIS is intentionally simple. Using a pre-developed template spreadsheet (see section The SponGIS Submission Template below), contributors can rapidly build a dataset with the required fields. Staff working on SponGIS will then check the submitted data, return it with any guidance notes or requests for clarity before converting and storing your data. If you wish to embargo the data for a period to allow publication, we are able to do this. Data submission has completed all required fields and these are done to a good and consistent standard. Terminology used to describe methodologies and so on, meet standard vocabularies. Taxonomic entries are checked against OBIS and the World Register of Marine Species. Additional data (i.e. short description, image) may need to be requested for new species being entered into SponGIS. Geospatial information is accurate and complete. Built to handle a variety of data, the SponGIS structure is based around the Darwin Core Events, Occurrences and MeasurementOrFact extensions. This allows us to handle species observations, environmental records and mapping data. Whilst still maintaining compliance with international data standards. The full explanation of the terms used are available in the SponGIS Excel Template, and you can view the database schema to the right or on Github. Dataset Details (Meta table): A dataset can comprise of any discrete data gathering exercise, for example it could be a bibliographic search conducted by an individual, with records being attributed to their original sources, but the dataset attributed to the individual who brought these records together. Or this could be a single, or multiple, research cruises. Species Details (Taxon table): Species details only need to be filled in once per species, and essentially the record becomes a species profile page on the website, first submitters are asked to provide an associated description and image that will appear on the species page on SponGIS. TaxonID is the most important field, as this must be linked to OBIS (if an OBIS record exists, if not, then it must be unique). Species must also have the WoRMS Aphia ID, which is recognised as an international standard for species names. Details of a specific space/time event (Event table): Events are spatially and temporally unique data collecting exercises. An event can be a child of a parent event (for example a cruise as the first event and then a CTD cast as the second event with the parentEventID set to that of the cruise eventID). Events must have spatial and temporal data associated with them for entry into SponGIS, a single event can have any number of Occurrences or MeasurementOrFact records. Most datasets will record multiple events. Species occurrences (ExtendedOccurrence table): These are species occurrences and must be linked to an event in order to have valid space/time data. Any number of occurrences can be assigned to an event, including different species or life-stages. Occurrences can also contain abundance/biomass data if required. Measurements (ExtendedMeasurementOrFact table): Measurements must be linked to an event in the same manner as occurrences. Any number of measurements can be logged to an event, and measurements of, for example, different depths can be assigned to a single event providing the spatial position does not change. Any type of measurement can be captured in this table. 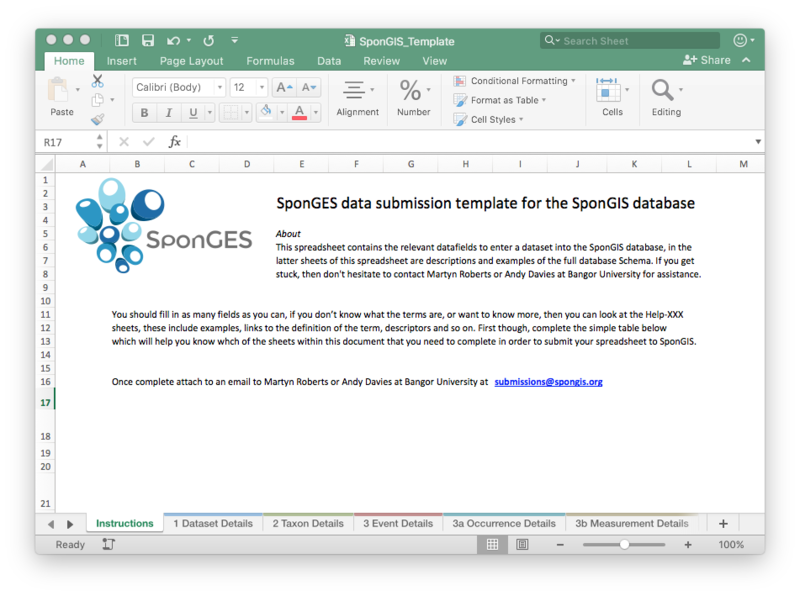 Written in Microsoft Excel, the SponGIS submission template has been designed to make it simple to translate existing or build new datasets that can be entered into SponGIS. The template contains several sheets, and has full explanation of each field in the database. You do not have to do anything else except fill in the template, SponGIS staff will convert the dataset (when accepted) into the required formats for archiving.